Everyone knows the stress that comes with having irritated skin, even if your complexion type isn’t particularly sensitive. You wake up one day, and suddenly, your face is plagued by dryness, rough patches, redness, and an uncomfortable tightness that screams “inflamed”. This plight is something the scientists at Lancôme have termed “chrono-sensitivity”, a state where temporary outbreaks are caused by environmental aggressors like UV rays, or internal triggers, like one’s hormone cycles or dietary habits. 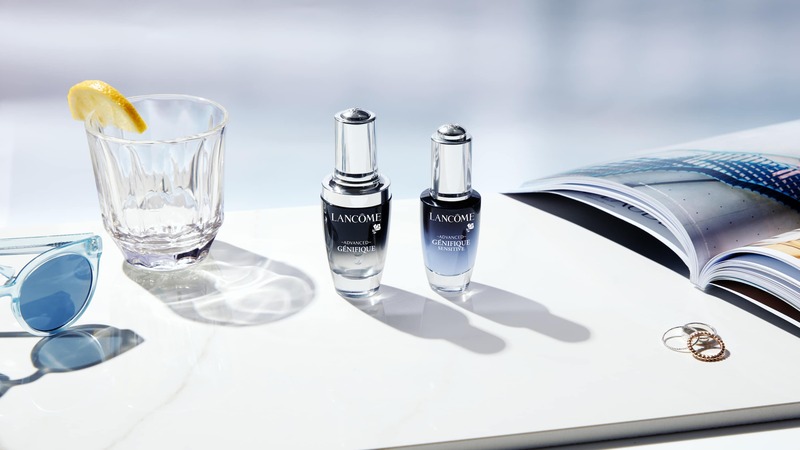 It has become the brand’s mission to alleviate this unpredictable and highly distressing sensitivity that hounds over 88 percent of women, and after intensive research, they have come up with a solution in the form of the Lancôme Advanced Génefique Youth Activating Duo. Comprised of their Advanced Génefique Youth Activating and Advanced Génefique Sensitive serums, this pair is designed to soothe your skin and restore its lustre round the clock on days where your face just refuses to cooperate. To add to its efficacy, regular use of both serums goes beyond reducing your skin’s chrono-sensitivity, but it begins defending against these outbreaks as well. The secret to achieving that marvel is probiotics — one of the key ingredients incorporated into the serums’ formula. We all know that probiotics are essential to gut health, but they are also extremely beneficial to your skin’s wellbeing too. Many major skincare creators have realised the wonders of probiotics, but these typically involve using only one or two kinds. The Lancôme Laboratories have brought about a major breakthrough by creating a cocktail featuring not one, but three major faction families of probiotics that are fantastic for skin health. This combination of lactobacillus, yeast and bifidobacterium becomes a probiotic powerhouse that is able to combat signs of irritation on your skin instantly, but the benefits go beyond that. These active ingredients also come with anti-ageing perks that keep the skin firm and plump, which is what you need if your complexion is inflamed, because stressed-out skin leads to fine lines and loose skin — trust us, that is the last thing you’d want. Use the Youth Activating Advanced Génefique serum during the day and the Advanced Génefique Sensitive serum at night for best results. Another element we love about the Advanced Génefique Sensitive is how rich in antioxidants the serum is. Everyone knows that antioxidants are crucial to keeping your visage youthful and radiant. The formula of this serum goes the extra mile to ensure that your skin is well protected against triggers that cause ageing as it contains 90 percent ferulic acid, one of the most popular antioxidant ingredients right now, alongside Vitamin E.
When used as a pair, the effectiveness of the Lancôme Advanced Génefique Youth Activating Duo has been clinically proven to increase by 18 percent. Applying the Advanced Génefique serum during the day results in smoother skin after a week while regular application of the Advanced Génefique Sensitive at night will reap far a far more resilient epidermis. You can guarantee they are better together. For anyone who has envisioned a product that can absolve you of all the woes of irritated skin, consider the Lancôme Advanced Génefique Youth Activating Duo the answer you’ve craved all this time. To find out more about the Find Your Light campaign, click here. To up for a 15-minute Skin Revival Treatment with Lancôme here. For special offers on the products, click here.